Training and skill-building for youth features prominently in the United Nation’s 2030 Sustainable Development Goals. Quality, inclusive, and relevant education for all is a key factor in breaking cycles of poverty and reducing gender inequalities worldwide. Today, on World Youth Skills Day, we are highlighting three organizations who dedicated to equipping youth and young adults with the skills needed to be successful in a changing global economy, and also sharing AWS programs that help build a pipeline of tech talent for the future. Digital Divide Data (DDD) is a nonprofit social enterprise creating sustainable tech jobs for global youth through “Impact Sourcing,” a model that provides economically marginalized youth with training and jobs in next-generation technologies such as cloud computing, machine learning, cyber security, and data analytics. DDD currently has over 1,500 associates across Kenya, Cambodia, and Laos. In 2017, in collaboration with Intel, AWS worked with DDD to launch the first-of-its-kind AWS Cloud Academy in Kenya to train, certify, and employ underserved youth in cloud computing as a stepping stone to more advanced IT careers. The first cohort was comprised of 30 high school graduates from Kibera in Nairobi. Prior to joining DDD, many of these youth had never even used a computer—and certainly had never deployed complex solutions. After an intensive six-month training and internship program, 100% of the participants passed the AWS SysOps certification test on the first attempt. In 2018, DDD launched the second cohort with 30 additional associates, 70% of whom are women, and they will all take the certification exam next month. DDD is planning on training five cohorts every year, for a total of 150-200 cloud engineers graduated per year. After graduation, these students will have the option to work for DDD as cloud computing engineers or to pursue cloud opportunities in the growing local tech sector. DDD and AWS graduates earn five times more than their peers. Informal workers in Kenya earn an average of $116 USD per month, while AWS graduates earn an average of $575 USD per month. The combination of training and work experience propels DDD graduates to earn higher income, gain economic security, and ultimately, create better futures for themselves and their families. For more information, please visit here and check out DDD’s Cloud Academy in Kenya. NPower creates pathways to economic prosperity by launching digital careers for military veterans and young adults from underserved communities. The organization’s development programs improve the shared economic prosperity of the students’ families and communities, while also strengthening the overall competitiveness of U.S. businesses hamstrung by today’s limited pool of IT talent. With programs in New York City, Texas, California, Baltimore, Toronto, New Jersey, and St. Louis, NPower offers an array of unique courses ranging from Tech Fundamentals (a foundational technology training program) to advanced training programs in areas such as cybersecurity. Beginning in August, NPower will work with AWS, Accenture, and The Heckscher Foundation for Children to facilitate its first-ever cloud computing course, preparing students for the in-demand AWS Solutions Architect certification. After these multi-month training courses, NPower works with students to convert their education into paid internships and job placements. NPower matches students with companies for job opportunities so the students’ new skills are put to use and they continue on the path to upward mobility. AWS teamed up with Girls in Tech at their Catalyst Conferences in London and San Francisco to encourage over 900 young women and girls in attendance to grow their careers in technology. Girls in Tech is a global nonprofit organization dedicated to the education and empowerment of women entrepreneurs and technologists, providing a multitude of training programs and events for their community of over 100,000 women around the globe. Teresa Carlson, Vice President of the Worldwide Public Sector at AWS, and Charlie Bell, Senior Vice President of Utility Computing Services at AWS, presented at the Catalyst Conferences, sharing their insights on how women can reach the next level of their careers in the tech industry and achieve their personal milestones. 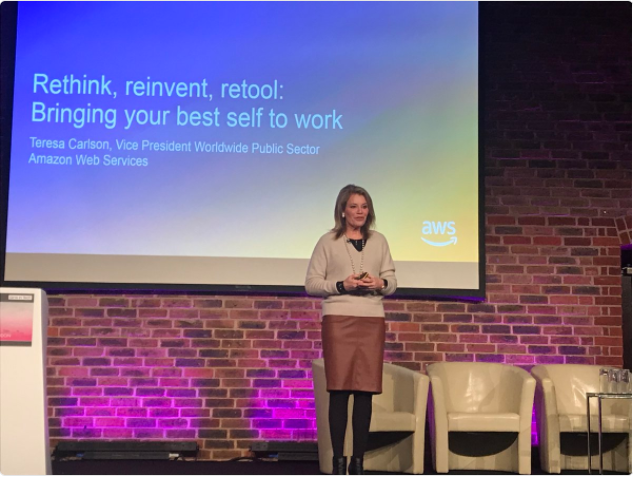 In London, Teresa Carlson shared her experience of reinventing herself and switching industries from speech pathology to leading a cloud computing business. She made sure that women in the audience walked away with their own action plans for navigating the tech industry. Her advice to women was: 1) record your accomplishments and set goals; 2) always learn and be curious; and 3) show your skills and tell your story. In San Francisco, Charlie Bell sat down for a special fireside chat with his daughter, Caroline Shouraboura, who is embarking on her first full-time job in DevSecOps after graduating from college. Caroline asked Charlie’s advice on a number of topics, including how to know when it’s time to make changes in your career, how he landed his role at AWS, and the importance of owning successes and failures in your career. Watch a clip from their presentation here. As the pace of innovation and new technology increases, all youth should have the opportunity to access training and educational programs, with the ultimate goal of pursuing rewarding careers in technology. In addition to working with many nonprofit organizations such as those mentioned above, AWS offers programs like AWS Educate, which allows students and veterans to access AWS training paths at no cost, and has recently established the first-ever Associate’s Degree program with a specialization in cloud computing with Northern Virginia Community College. Taken together, all of these efforts will help youth around the world to be prepared for successful futures.